You guys. 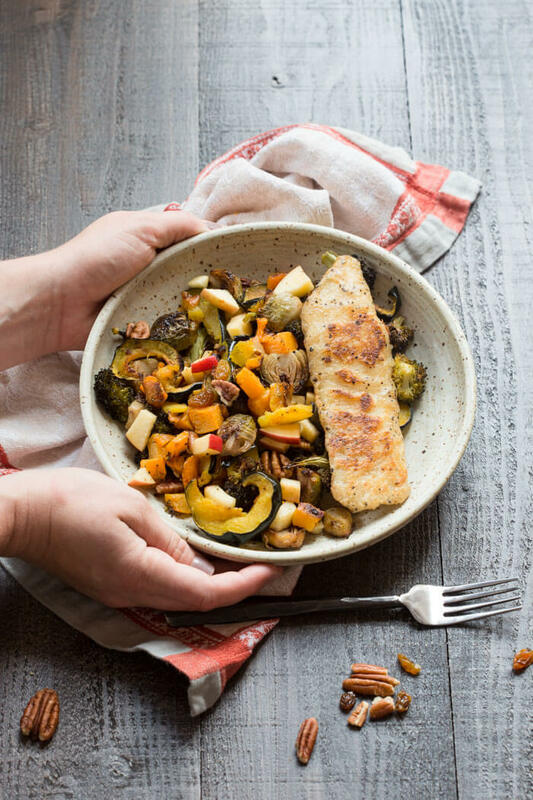 This Harvest Vegetable Medley with Skillet Crisp Tilapia is everything you want to eat this time of year. TRUST ME. Of course butternut was at that top of that list and acorn too because hello it’s soooo pretty, especially when roasted. 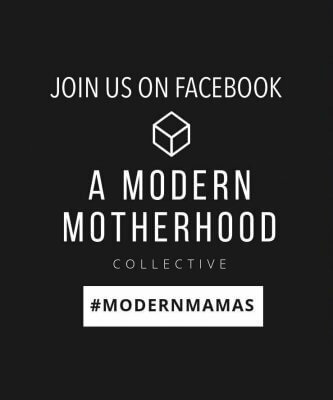 And did you know that you can eat the skin of an acorn squash? Seriously cool and gawgeous! Broccoli florets helped to add more volume to the dish to feed a crowd (and I had two bags on hand that needed to be used). After the veg finished roasting, I felt super festive so I tossed in fresh diced apples, pecan halves, and golden raisins just before serving. AND OMG– Harvest Vegetable Medley has upped her game. We roast veggies often in our house, and while the preparation is quite simple to me and you may already make veggies this way in your home, I thought the combo of vegetables in this recipe along with tossing with fresh ingredients at the end really elevates this dish. After sending this “recipe” to friends upon their request, I realized that maybe you would want to know about this Harvest Vegetable Medley too? Am I right? 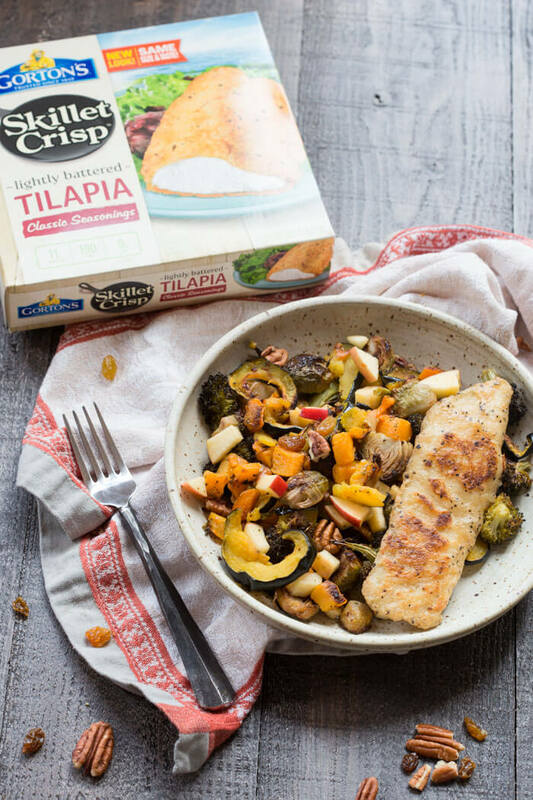 So equally as important as harvest vegetable medley is Skillet Crisp Tilapia, because… protein. When it comes to getting in the recommended two servings of seafood a week, I can’t say I always succeed. In fact more often than not I don’t eat enough seafood. Even though I LOVE FISH! There are many reasons why this happens, but mostly because I find that when I cook fresh seafood at home, I’m taking a gamble. Do you get me?? or it’s under or overcooked. So when it comes to eating tasty seafood, I rely on canned and frozen sources. Unless you are a fisherman or live in a coastal region where you can get fish caught fresh daily, frozen uncooked fish is the way to go– in fact it’s the freshest. Gortons Seafood is sustainably caught (read about their sustainability practices), and it’s flash frozen to help maintain quality and nutrition in the fish. Most of all, I love that Gorton’s Seafood is simple to prepare and tastes great. Convenience that I can trust. 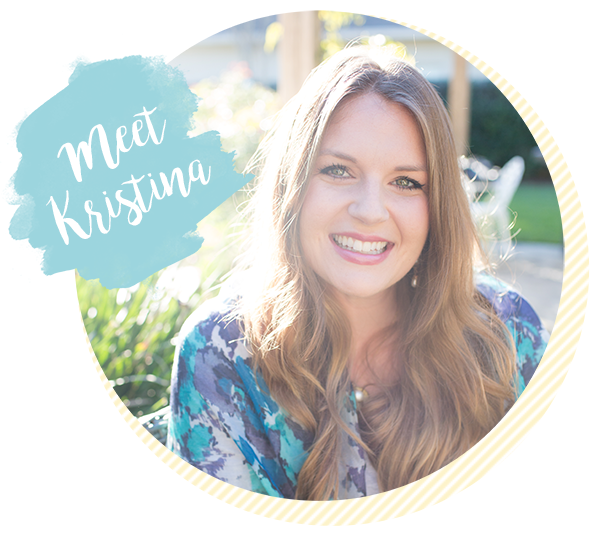 My new favorite is this Skillet Crisp Tilapia Fillets… even my toddler is a fan thanks to the crispy texture and taste! I lightly coated the cast iron skillet with butter and cooked the frozen tilapia right in the skillet. And guess what?! To my surprise there was no sticking or crumbling (both problems I have encountered when cooking fish in the skillet). 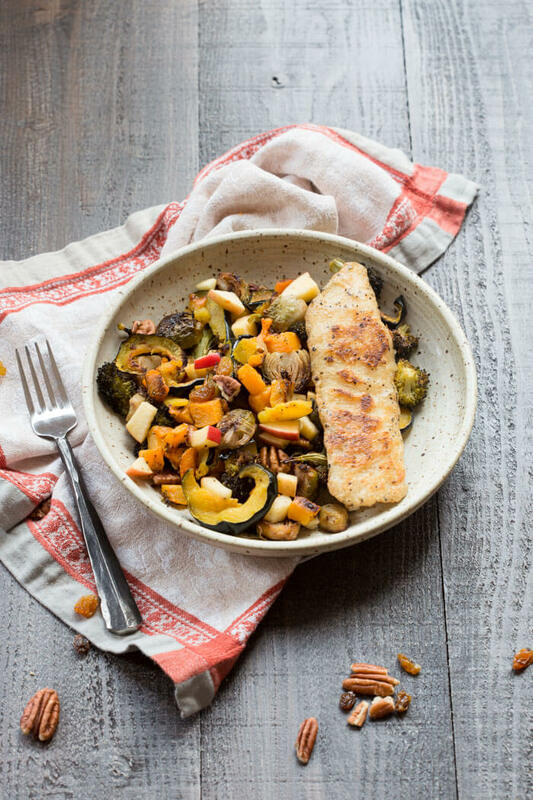 I hope you enjoy this Harvest Vegetable Medley with Skillet Crisp Tilapia too! You guys…This Harvest Vegetable Medley is everything you want to eat this time of year. 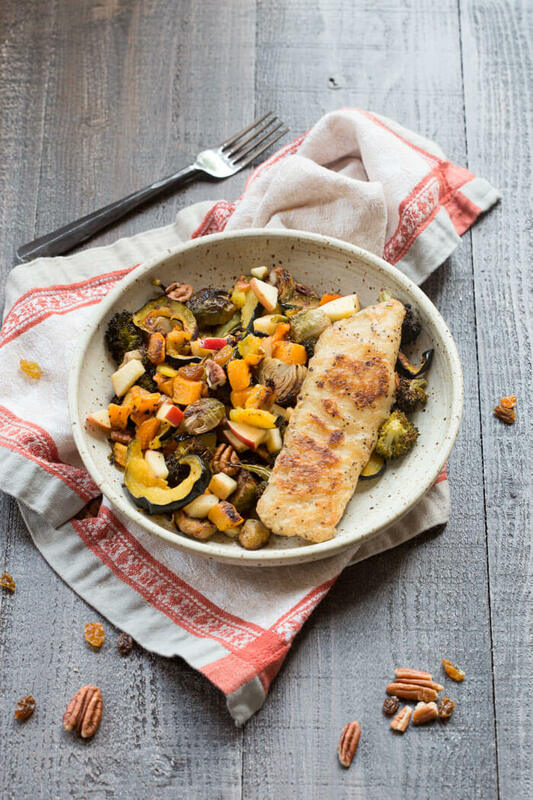 Roasted butternut squash, acorn squash, Brussels sprouts, apples and pecans. So good. Trust me! Preheat oven to 425 degrees Fahrenheit and line a large baking sheet with parchment paper. Spread vegetables evenly on baking sheet, making sure not to overcrowd the pan. Drizzle olive oil and toss veggies to evenly coat. Season with salt and pepper. Roast vegetables in oven for 1 hour, or until desired doneness. Vegetables will be slightly crispy and browned in color. 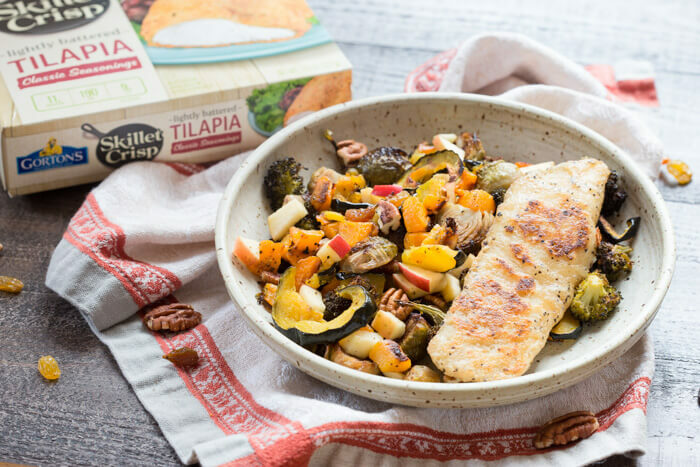 While veggies are roasting, prepare the tilapia in a cast iron skillet according to package directions. Once veggies are out of the oven, toss with apple, raisins, and pecans. Serve immediately. I love the combination of veggies and fruit and nuts here! I’ve never tried these veggies like this and now I definitely want to! Looks so delicious and perfect for dinner! 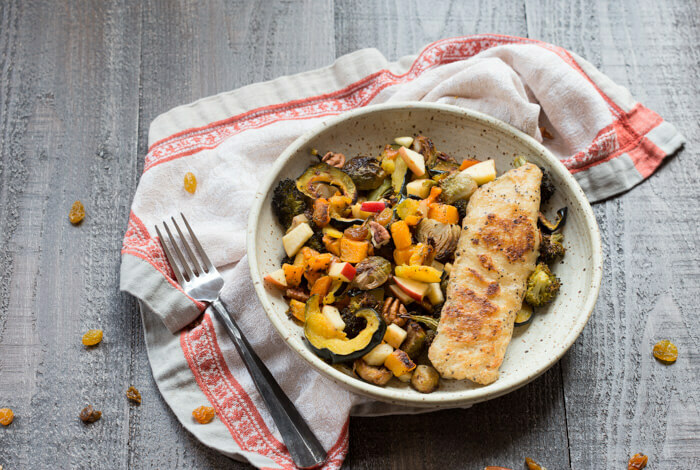 Love that you’ve included a fall veggie medley. So pretty and yummy! I love all of the flavors and textures you included in this dish. I’m going to have to check the ingredients on that fish to see if it’s something we can eat in our home! I’m obsessed with squash and Fall veggies right now! I can’t get enough. They’re so comforting! This looks great. Looks so delicious! I wish that was dinner tonight. I love the flavors and all the fall veggies you have packed in, a very well rounded easy to make dish! Love all the colorful veggies in here and the sweet addition of apples! This looks so good and perfect for fall! This sounds like an amazing and easy dinner idea for fall. Can’t wait to give it a try! Looks super delicious. Harvest veggies are the best! 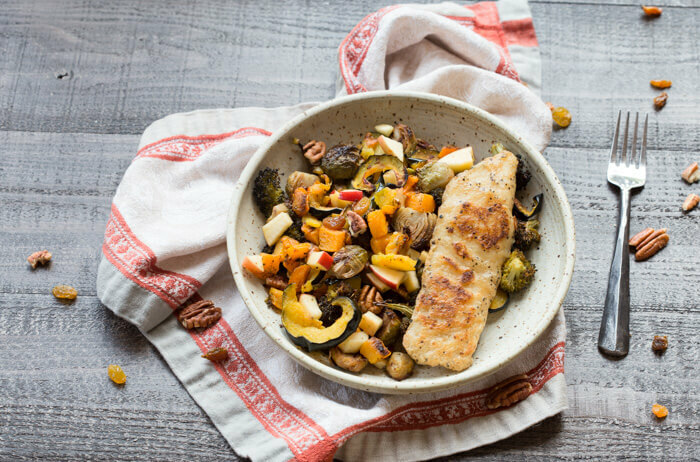 I’m loving all the fall produce in this dish! Yum! 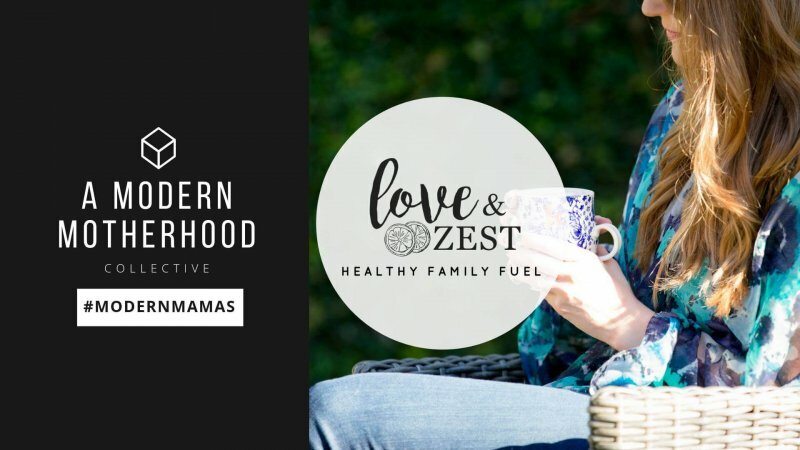 This is the perfect meal for any night of the week!